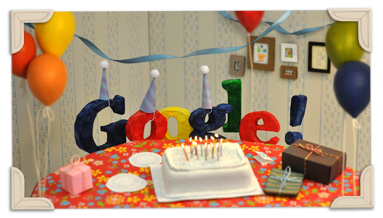 That's right, Google is now officially a teenager, celebrating its 13th anniversary with a very festive Google Doodle. While the Google effect we all know today didn't happen overnight, and was barely noticeable in its first years of existence in the pre-2000 era, no one can deny the impact Larry Page and Sergey Brin's project would eventually have in the entire web. Google allowed us to find what we were looking for, without having to sort through "yellow pages" style reference sites... And, Google went many steps further, entering other areas like Gmail, Google Maps, and lots others (even if not always ending successfully). Anyway, with over 1 million servers (estimated) worldwide, Google is now one of the internet giants of our day, and has even managed to step out of the "virtual" world into the real world, with its Android smartphone and tablet platform.